Hip-Hop, Poetics and Politics (ES 310) presented its annual Hip-Hop Symposium March 14 in Chumash Auditorium in the Julian A. McPhee University Union. The event gave students in the class an opportunity to display the elements of hip-hop while emphasizing the cultural and historical influences of the art form. Keeping Learn by Doing in mind, ES 310 professor Jenell Navarro gave her students a chance to implement what they learned in class through this event. “We go through issues that were really the spark for Black and brown people in the Bronx to create what we now know as hip-hop culture,” Navarro said. 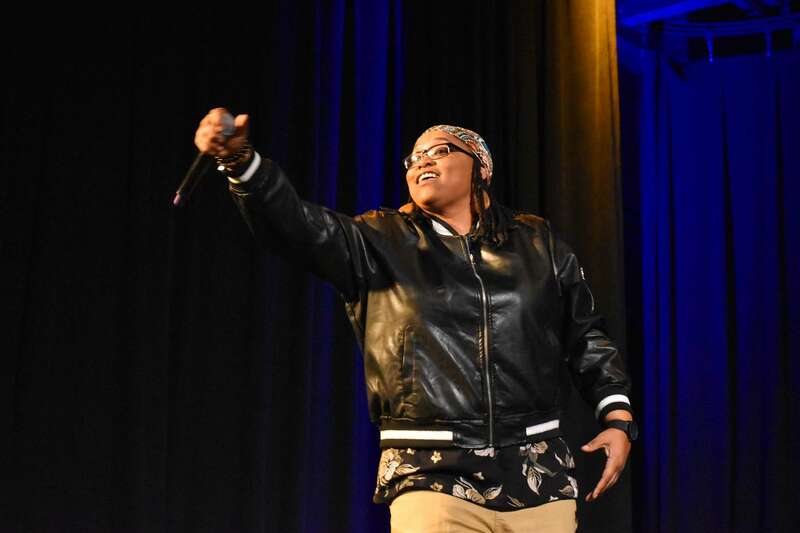 The Hip-Hop Symposium showcased various forms of hip-hop, including performances by Cal Poly QTPOC dancers and SLO Breakers, raps, spoken word poetry and a performance by featured artist set FIFTY50. The event presented consciousness of the political, cultural and racial oppression rooted in society, all of which are discussed in the course. According to Navarro, this event also serves as a sort of liberation for some of her students. “I do it for the students every year because it is something that they can look forward to, that they can actually participate in, that they can feel really good about when, quite honestly, their experiences at this institution aren’t always giving them those opportunities,” Navarro said. Navarro’s teacher’s assistant Jeremiah Hernandez said the goal of the Hip-Hop Symposium is to emphasize that there is more to hip-hop than just music. “A lot of times for students of color, hip-hop is just embedded in their community. It’s what we listen to, it’s what we live by, it’s what represents us, whether we realize it or not,” sociology and ethnic studies senior Hernandez said. Hernandez added that when people of color (POC) try to express their culture, it is often times challenged by society. At the event, students shared their experiences through the art of hip-hop. During the performances, feelings of consciousness, frustration and the urge for justice were evident. According to Navarro, events like this one are necessary in a predominantly white institution. Navarro alluded to a quote from one of the grandfathers of hip-hop, DJ Kool Herc, as she described why hip-hop is so important in the midst of oppression. “’It serves as a sort of medication from all of the ongoing forms of oppression that people of color still face,’” Navarro said.